Recommended to: Readers who are okay with books dealing with tough issues. 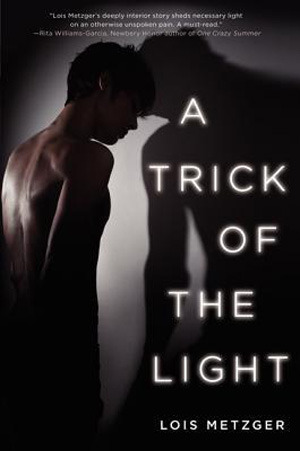 Telling a story of a rarely recognized segment of eating disorder sufferers—young men—A Trick of the Light by Lois Metzger is a book for fans of the complex characters and emotional truths in Laurie Halse Anderson’sWintergirls and Jay Asher’s Thirteen Reasons Why. I'll admit that what first drew me to A Trick of the Light was that it dealt with something I haven't seen before. Books that deal with anorexia are almost always about females, but this one follows a male character. Even stranger, Lois Metzger chose to have anorexia as the narrator. The reader sees how it this disease becomes an all consuming entity, taking over from the inside out. Mike's story moves lightning fast, and I can't deny that I was hooked. I know it might seem off at first, but I truly believe that Metzger's choice in narrator was spot on. We all know many teens deal with self image problems. Mike feels like his life is falling apart and, when he meets the wrong girl, his image problems turn into something much more. His story turns ugly quickly as his own voice is drowned out by the one in his head. It was hard to look away as he lost himself to this aggressive disease, and his life spiraled out of his control. It was pretty amazing to me how well this story was told in such a short amount of pages. It doesn't go quite as deep into the consequences of anorexia as some other books. However it definitely skims the surface well enough to show how quickly the onset can be. It's a quick visit into the life of a person who was able to make it out of the abyss. As much as I would have liked to dive deeper, it was emotionally exhausting enough just to read Mike's story as it was. 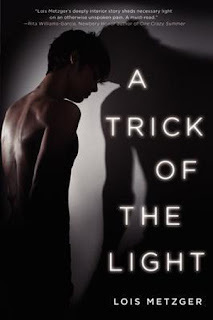 A Trick of the Light was a different read, and one that I'm glad is out there in the public eye. It's not often that you see a male portrayed in a book about anorexia, even though they suffer from it too. While short, it's well written and intriguing. I'd recommend you give it a read.